I haven’t done a wine post for a while, mostly because I’ve been a bit lazy. But I had to get my act together for this one. Having had so much fun with the Stonecroft Gewürztraminer from Hawkes Bay in New Zealand, I thought I’d try this one from the famous Cloudy Bay winery in NZ’s Marlborough region. We took this bottle to our favourite Thai restaurant, knowing that the spiciness of the wine would suit the food. I had a spicy duck stir fry, which was dressed with a touch of Thai red curry and coconut cream, and M. had a vege stir fry with cashew nuts (her favourite). The food was excellent as usual, and complemented the wine nicely. Firstly, this is a very different beast to the Stonecroft. It has that lemon-lime citrusy aroma, with a hint of jasmine, and maybe orange blossom this time. The taste is immediately sharper, with the spice hitting up front, over layers of honeydew melon and lychees. There’s some slightly chalky minerality mixed in, and a merest hint of fermentation fizz. And there’s a hint of sweetness, and an orange marmalade bitterness at the back end, mixed with black pepper spiciness. Again, there’s heaps going on, and it makes for an incredibly complex range of sensations. Interestingly, M. didn’t like this one much, despite really enjoying the Stonecroft version. I could tell they were very different, and I have to agree the Stonecroft is more to my liking, but I enjoyed the complexity and flavours in this one too. 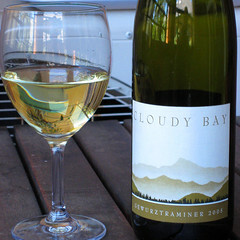 I guess I’ll stick with Cloudy Bay for top-notch Sauvignon blanc, but go further afield for Gewürz. We wanted a sweet wine for dessert last weekend and spotted this in a shop. It wasn’t cheap, but I was keen to try it. 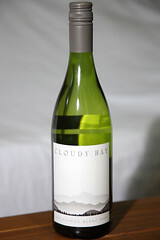 Cloudy Bay is a famous New Zealand winery, in the Marlborough region, best known for its world-famous Sauvignon blanc. 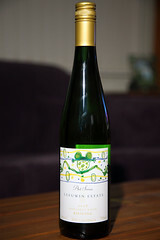 I’ve tried some Riesling before and it has, in my mind, a very distinct aroma. I noticed it as soon as I sniffed a glass of this one. It was citrusy, with lime the dominant fruit. And that distinctive smell of Riesling… I don’t know how else to describe it – it doesn’t remind me of anything else in the world. Sort of sweetish, minerally like a handful of wet gravel, and also fragrant like alpine wildflowers, with a piercing quality of fresh cold air, perhaps a tiny bit like bleach, although not unpleasant. Overall it’s a positive aroma, but hard to describe without rifling my aroma vocabulary for unusual descriptors. The flavour was sweet and citrusy, tangy with acidity, and a slight hint of spiciness, like an apple strudel made with tangy green apples and just a faint touch of cinnamon. It wasn’t syrupy sweet, and in fact the sweetness was so restrained that M. declared it didn’t taste to her like a dessert wine at all. It was in the continuum between the ever so slightly sweet Gewürztraminer we had a while back and a full-on dessert wine. I could actually see having this one with a meal of fish, rather than dessert. I actually had it with cheese and a fresh pear, which matched nicely – I don’t think it would have worked with a chocolate cake. 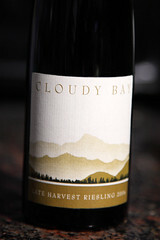 I look forward to seeing if the next Riesling I have also has that unmistakeable “Riesling” aroma – if it’s indeed a constant then I can confidently say that I could pick Riesling out of a line-up of white wines without any trouble at all. I only hope at some point I start to get a similar feel for reds. The next week should help, as we’re taking a vacation trip to Western Australia, and spending a few days in the Margaret River wine region there, so should be dropping in on a few wineries.